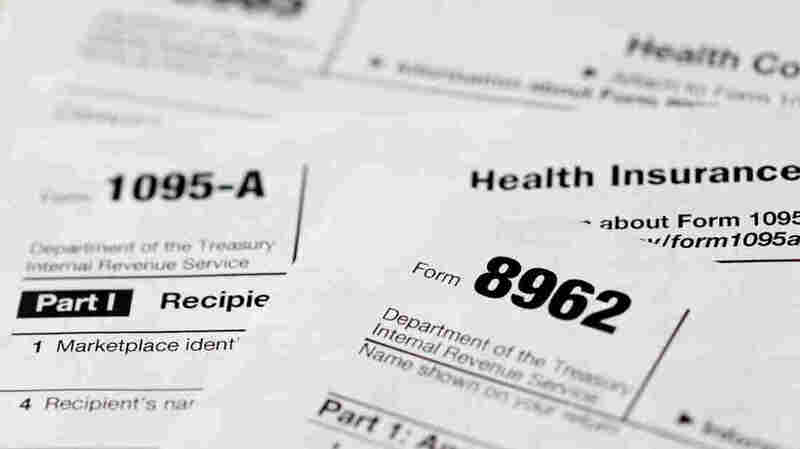 IRS: 7.5 Million Americans Paid Penalty For Lack Of Health Coverage : Shots - Health News Americans paid an average penalty of $200 for not having health insurance in 2014, the first year most Americans were required to have coverage under the Affordable Care Act. The IRS released preliminary figures that show about three-quarters of taxpayers indicated they had qualifying health insurance in 2014. About 7.5 million Americans paid an average penalty of $200 for not having health insurance in 2014 — the first year most Americans were required to have coverage under the Affordable Care Act, the Internal Revenue Service said Tuesday. By contrast, taxpayers filing three-quarters of the 102 million returns received by the IRS so far this year checked a box indicating they had qualifying insurance coverage all year. Counting another 7 million dependents who weren't required to report their coverage but also filed returns, the proportion with qualifying insurance rises to 81 percent, the IRS said. The government had estimated in January that from 3 million to 6 million households would have to pay a penalty: 1 percent of their annual income or $95 per adult in 2014, whichever is greater. Final figures for the tax year aren't available yet. The IRS has so far processed about 135 million of the estimated 150 million returns expected. IRS Commissioner John Koskinen said the agency was reporting preliminary figures because it has received "numerous requests" from members of Congress. In addition to penalty totals, the IRS reported Tuesday on tax subsidies the health law provided for people who were buying coverage through the state or federal online exchanges and who qualified based on income. People had a choice of filing for credits in advance — money the government paid to their insurers — or when filing tax returns. About 2.7 million taxpayers claimed approximately $9 billion in subsidies, reporting an average subsidy of $3,400. About 40 percent claimed less than $2,000, 40 percent claimed $2,000 to $5,000, and 20 percent claimed $5,000 or more. Among taxpayers who claimed a subsidy, about 1.6 million, or half of taxpayers who claimed or received a subsidy, had to pay money back to the government because their actual income was higher than projected when they applied for the subsidy. The average amount repaid was about $800. When looking at the individual mandate, the report said the vast majority of people automatically satisfied the individual mandate because they were insured last year. Another 12 million had exemptions, including people whose incomes were too low and Native Americans. In all, the IRS said it has collected $1.5 billion from the individual mandate penalty included in the health law. About 40 percent of taxpayers who paid a penalty paid less than $100. About 300,000 taxpayers who made an individual mandate penalty payment should have claimed an exemption but did not, the government said. The agency is sending letters to these taxpayers telling them they generally have three years to file an amended tax return. More than 5 million taxpayers did not check the box on their tax form saying had coverage, claim a health care coverage exemption, or pay a penalty. "We are analyzing these cases to determine their status," the government said.